Our durable above-ground blankets can warm your pool this year by up to 15 Degree F. Our blankets are made to give you maximum heating properties combined with long life. A Solar Pool Cover is the least expensive kind of swimming pool cover. They are also called solar blankets. Solar Pool Covers or Blankets resemble giant sheets of bubble wrap. The bubbles trap heat from the sun and transmit the heat to the pool, keeping the water temperature warm and inviting. The solar cover also helps to trap the heat of the water and prevents its escape into the cool night time air. Solar covers float freely on top of a pool without tie-downs or anchors to hold them in place; therefore, removing a solar cover is easy, just pull it off and store it. This job can be a bit sloppy - imagine folding a giant wet blanket by yourself - but recruiting a helper or the aid of a solar pool cover reel makes the task much easier. Solar covers are usually folded and stored or rolled-up on a large reel and wheeled out of the way. Solar Blankets are ideal for use in sunny climates because the more heat they can gather, the longer they can extend the swim season. Solar pool covers can raise water temperature by as much as 10-15 degrees. 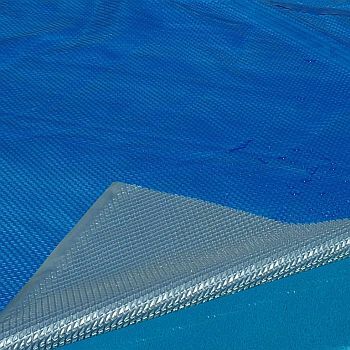 It is important to remember that, although any cover will reduce some of the debris that enters a pool, solar pool covers are not designed specifically for cleanliness, nor are they considered safety covers. Solar pool covers must be completely removed from the pool before swimmers enter the water. Space Age Solar Blankets have a 5 Year Warranty.